Sand T of artSPACE@16 is grateful for having the opportunity to be a part of establishing this exhibition space housed inside the facility of Malden Access Television in downtown Malden. 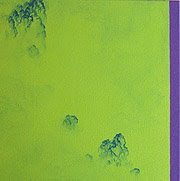 Provided start-up consultations on gallery setting, exhibition contract sample, and hanging system. Curated its premier exhibit entitled AMBIANCE featuring 9 artists. Exhibition Dates: October 21 - December 13, 2002. Project involvement included but not limited to organizing and planning, identify artists and theme, conducting studio visits, exhibition design and installation, invitation design, web page design, community outreach; support public affairs/PR, reception, and co-coordinated video interviews of all 9 artists. 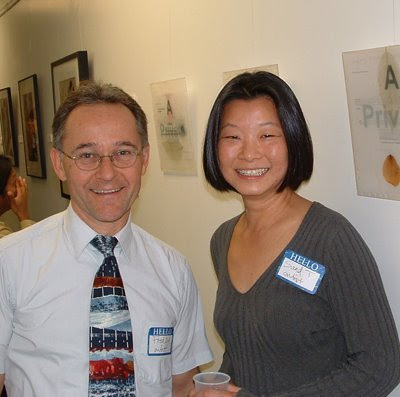 Image: Sand T, director of artSPACE@16 with participating artist Brother Frederick C. Eid (left) at the opening reception held at MATV Art Gallery in 2002. Malden Access TV presents the Grand Opening of its new Art Gallery! The MATV Art Gallery provides a new creative venue for local artists and broadens the local community's exposure to art. This new venture for MATV expands upon its mission of "Building Community Through Media". The Art Gallery project is supported in part by a grant from the Malden Cultural Council, a local agency supported by the Massachusetts Cultural Council, and by the Adelaide Breed Bayrd Foundation. MATV is supported by franchise fees from AT & T Broadband provided through the Office of Malden Mayor Richard C. Howard. AMBIANCE, the premier exhibit at the MATV Art Gallery features the work of nine artists and is being curated by SAND T, a local artist, independent curator, and community builder. AMBIANCE explores the many ways the natural world is being portrayed, described, quantified, considered and experienced through oil, acrylic, pastel, mixed media collage work, traditional Chinese brush painting, and art objects. Nine visual artists express the essentials of "the land" in a broad sense - whether literal, metaphoric, or symbolic. You're cordially invited to a reception with artists had been scheduled for Tueday, Oct 22, 2002, from 6 - 9pm. Gallery Hours are Mon - Thus 10am - 9pm; Fri 9am - 6pm; Sat 10am - 5pm. MATV Art Gallery is housed inside Malden Access TV located at 145 Pleasant Street, Malden. For more information, please contact MATV at 781-321-6400. Featuring Nine Artists: Brother Frederick C. Eid, David Fallon, Wesley Victor Kalloch, Cuong-Quoc Phu, Heather Pilchard, SAND T, Sam Tan, TattFoo Tan, Sharon Wu. Brother Frederick C. Eid uses landscape and figurative images as his inspiration, he creates paintings and drawings -- often abstract and mostly in pastel -- that attempt to communicate his response to the world around and within him. He teaches math and studio art to Malden Catholic High School students. He also advises the student newspaper staff, yearbook staff, and photo club. Whenever possible, he produces artwork as a model of behavior for his students. He prays that the loving force of God may flow freely through his work. 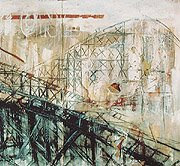 David Fallon presents mixed media painting series entitled ATMOSPHERE AND MEMORY. Fallon recalls his New Jersey childhood, surrounded by a safe and beautiful world. 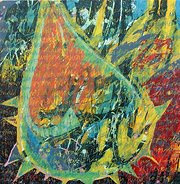 After graduated from the Museum of Fine Arts School in 1998 Fallon's art became more abstract and then more humorous. Fallon works in different materials. Oils, acrylics, paper and collage and wood, and try to bring a child's wonderment to his work. It is the wonderment that adults sometimes lose that he attempts in regaining in his work. Wesley Victor Kalloch presents oil paint with other media on these landscapes paintings. Kalloch works with photos and memories and has injected these pieces with a bit of "heightener" In other words, the unique essence of the scenery. This work looks past the trees and stones. Hopefully they show the supernatural power certain landscapes can possess. 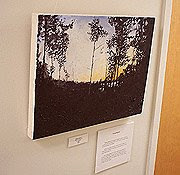 Kalloch has been showing his paintings and art installations in the greater Boston area including Malden. Cuong-Quoc Phu presents his Chestnuts painting series. Applying texts, was a way for the artist to define self-confidence. Together, texts and layers of paint are collaborated to create a mixture of ingredients for the blank canvas. The blanket of words add texture, patterns, depth, and chaos, giving the sense the painting itself is on a process of thoughts, growing like a wild weed. In the paintings, Phu wanted to strive for a natural sense of undeveloped, unfinished and on- going process. Heather Pilchard represents the landscape in bite size pieces - - experiencing nature on a micro level. She works intuitively rather than with a set agenda. Loyal to the one theme she has been working on concerning the natural world. Heather has created mixed media art objects using mental notes she made of nature, photographing places as reference points, and collecting found objects all used as markers for places she has visited. The photographs and found objects have worked themselves into her art, sometimes becoming abstract in form such as the bark piece in the show. SAND T displays Problem Solving, a series of four mixed media collage work on plexi panels. Problem Solving is an exploration of self through the manipulation of the various media, such as dried leaves, rose petals, computer generated images, journal excerpts, and email texts. This series reveals different thoughts, identities, experiences and personalities. Much like an individual attempting to look at a dream from different perspectives. Each perspective expressed in the works might or might not help to solve the "Problem" Essentially the act of expressing, listening, judging, and accepting each others' perspective are left. Sand T examines the physical and psychological space, exploring the boundaries between self and others, dreams and realities. Sam Tan's intention behind the Shifting Ground series was to create a body of work that explored the effects of the constant evolution of culture on our personal identity. The paintings have a defined ambivalent mood - one that is created by the integration of the traditional and contemporary elements within the works. Though the source inspiration for the environment/imagery depicted is clear (i.e. classical Chinese brush ink landscape painting), it becomes unfamiliar as the scale and color have drastically changed. Also a reductive aesthetic has permeated into the paintings, pushing them further into a contemporary light. Tan’s paintings series shown in Ambiance exhibit as they are not only atmospheric contemporary paintings, but they allude to a contemplative theme on the uncertainties of a dynamic perpetually changing and shifting cultural landscape. TattFoo Tan explores his roots as a Chinese descendent born in Malaysia in his tanah air_the cultural hybrid series. This series is a search for his upbringing, identity, integrity and faith. Tanah Air -literally translated as soils and water as a place that nurtures and molds Tan's identity. He uses traditional Chinese patterns and symbols, paints with bold brush strokes, multiplying it’s layering, scraping and restoring to another. This is a process Tan calls “molting”. Molting- a process where old habits and belief are no longer practiced, where new ideas and philosophy give birth to a new ideology in life. It reflects the way he looks at his journey in life. Sharon Wu has worked in the art of traditional Chinese brush painting for over 30 years. She is blessed with a detailed botanical technique. Her work also portrays landscapes and birds. She employs traditional medium using traditional symbolism to express traditional values, such as a songbird as symbol of freedom, happiness, or Spring.